The Annual Report released by RBI has published trends detected in counterfeit notes in the banking system for the year 2016-17. As per the report, 762,072 counterfeit notes were detected in the system and it was 20.4% higher than the previous year. Approximately 98.96% of SBNs are reported to have come back to the RBI, post demonetization. The Finance Minister, Sh. Arun Jaitley, unveiled NITI Aayog’s Three Year Action Agenda, which forms an integral part of its 15-year Vision Document of India. A number of policy initiatives have been prescribed, with a major focus on reforms in the agricultural and Industrial sectors. Additionally, job creation is a concern addressed in the report, by suggesting reforms in the exports sector, leading to more competitiveness, more output and naturally, more jobs. The Central Board of Excise and Customs (CBEC) has published a list of frequently asked questions related to GST law, procedures, tax rates, etc., for the benefit of taxpayers. This can be accessed here. Key words or topics can be used to search for information, under the ‘Services’ tab. Information on matters ranging from handicraft to mining can be found on the website. The estimates, released by the Central Statistics Office (CSO), have indicated a growth rate of 5.7%, lower than the 7.9% growth recorded in the corresponding quarter last fiscal year, and the 6.1% recorded in the previous quarter. The analysis report indicates that steps are being taken to bring all ministries and departments under the e-office mission mode project by the end of this year. Major issues and grievances are being identified so that solutions can be sought appropriately. The department is also in the process of developing Development Goal Manual and a Good Governance Index. A Project Management Unit and a dedicated team has been put in place to monitor reforms in consultation with concerned Ministries and Departments and to understand the impact of such reform measures. 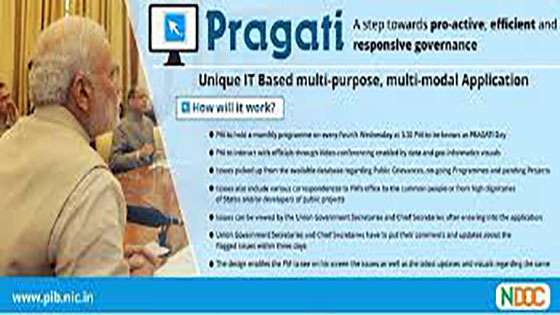 The 20 previously held PRAGATI meetings has led to a cumulative review of 183 projects and Public Grievances’ Resolution review in 17 sectors. The focus of this meeting’s review was on progress made in grievance redressal with regard to patents and trademarks. Some other projects reviewed include the Smart Cities Mission among the nine vital infrastructure projects in road, railways and power, worth over Rs.56,000 crore. Emphasis was also laid on the use of space technology for empowering tribals by determining their rights. The state government of Uttar Pradesh has proposed to operationalise a 1000- seater grievance cell in Lucknow, called as the ‘Chief Minister’s Helpline’, for the purpose of handling as many as 80,000 calls a day from residents across the state. The CM’s helpline will arm citizens with a very important tool – of simple calling up a number and reaching the CMO with their grouse and getting an assured timeline for redressal. This move aims to solve citizens’ grievances at their doorstep in a time-bound manner. Giving an impetus to the Swachhta Mission,started in 2014, the 2nd of October, 2017, will witness awarding of media organizations, for their contribution in making Swachhta, a janaandolan through awareness generation and other initiatives. This is also the third anniversary of the Swachh Bharat Mission. Organizations are expected to send their entries by the 10th of September. The Ministry of Drinking Water and Sanitation will set up a jury who will evaluate the entries to select winners. The main objective of this initiative is to give a boost to the magnitude of awareness generation programmes on the importance of nutrition, with the concerted effort of various Community Food and Nutrition Extension Units and other concerned departments in States and UTs. The theme for the event is “Optimal Infant & Young Child Feeding Practices: Better Child Health”. Many activities are being organised at state, district and village levels, including workshops and lectures, for the benefit of state and district level officers. Ministry of Science and Technology’s Department of Bio-Technology organised the conclave for the purpose of creating a roadmap, to set up “FarmerZone”, a cloud service collating important agricultural data. This zone will serve as a multi purpose window addressing concerns of the farmers anywhere in the world. The conclave was organised to discuss about issues that farmers face and find solutions for the same, using cloud technology. In keeping with the Digital India initiative, the Government has decided to provide a secure email service for all its officials to use, for secure communication. As per the email policy, an email ID will be assigned to all Central and State Government officials through the National Informatics Centre. This step is slated to increase productivity by keeping the Government employees better informed and increase their participation, and is also a move towards attaining Green Government. The CPWD has undergone a digital transformation, enabling payments worth Rs.20,000 crore per year to be carried out electronically. This step will help monitor expenditure incurred on projects and efficient utilization of funds. The Department of Industrial Policy and Promotion has set the ball rolling to draw up the new Industrial Policy, intended to make India a manufacturing hub. The new policy will subsume the National Manufacturing Policy, and will review FDI policies so as to facilitate greater transfer of technology. The DIPP has undertaken a consultative approach by creating thematic focus groups and conducting an online survey to gather inputs. The Hon’ble Minister of State for Commerce and Industry will be holding consultations with stakeholders like think tanks and a few state governments as well. Energy Efficiency Services Ltd. (EESL), Ministry of Power, has initiated this measure as a means to reduce occurrences of AT&C losses, power theft and achieve greater energy efficiency in the process. The Pre-Bid Meeting for procuring the metres has received a very positive response from manufacturers, and has also succeeded in attracting the attention of various other stakeholders including the World Bank. About 100 companies participated in the pre-bid meeting, indicating an increased interest in India for such initiatives. The Government of India has proposed to organize handloom and handicraft camps across India, under the ‘Hastkala Sahyog Shivir’ initiative. This initiative, dedicated to Pandit Deendayal Upadhyay Garib Kalyan Varsh, on his birth centenary year, will be held from the 7th October to 17th October. A wide variety of services and assistance will be made available to artisans and weavers to boost their business prospects. The idea is to take this forward to more than 200 block level handloom and handicraft clusters each. Union Minister for Sports and Youth Affairs, Vijay Goel, provided an opportunity to slum children from across Delhi, to watch FIFA U-17 World Cup trophy at his residence. The kids also received footballs as gifts. Inspired by the motto of “KhelogeToKhiloge”, Mission 11 Million programme seeks to take football to 11 million kids across the country, through 15, 000 schools. This has reached 8 million kids so far, through 12, 000 schools across the country. The first edition of Grameen Khel Mahotsav will kickstart in Delhi (28th August- 3rd September), with the aim to popularise indigenous games such as, wrestling, tug of war, athletics, etc. This event is slated to see a participation of 16,000 youth from rural Delhi. The practise of organising such events will be encouraged in other states as well, so as to enable grassroots level players to showcase their talent. The Ministry of Youth Affairs and Sports has launched a portal to identify the best sporting talent in the country. This initiative seeks to identify talented players and mould them into world champions. Steps towards achieving this will be taken by the Sports Authority of India (SAI), who will start by selecting prospective talent based on the bio-data or video uploaded on the portal. The ones selected will be trained and developed into competing athletes. The first phase of reforms in the Armed Forces will begin with the aspects of redeployment and restructuring of approximately 57,000 posts of officers. These reforms are expected to be completed by the 31st December, 2019. It is part of the first ever reform exercise being undertaken in this sector. These measures are aimed at improving combat capability and for achieving an increased level of operational preparedness.